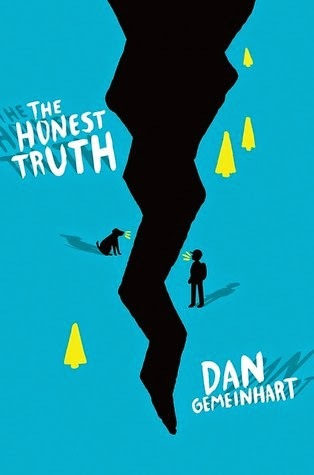 The Honest Truth by Dan Gemeinhart. Grades 4-7. Scholastic Press, January 2015. 229 pages. Review copy provided by publisher. Book talk: Mark has cancer. He was first diagnosed when he was a little kid.. and he got better, but now the bad headaches are back again and a call from the doctor confirms that the cancer is back. And this time might be for good. Having been through rounds of treatments and the dread of not-knowing before, Mark decides to do something different. He wants to make sure that he lives before he dies. And more than that, Mark needs to take control of something. So, he decides to climb a mountain. It may sound crazy - Mark's sick, he's weak, he knows this could possibly be the last thing he ever does. But he needs to do one heroic thing on his own, with nobody's help, before whatever is going to happen to him happens. He leaves a note for his parents and one for his best friend and he trickily buys a bus ticket headed the wrong way before taking the train to Seattle, towards Mount Ranier. Half-chapters tell the story of the folks left behind - Mark's parents who are distraught and frantic with worry and Mark's best friend Jess. Jess knows where Mark is headed, she figures it out from the note he left her. But she also knows that Mark trusts her to keep his secret, that he would not want her to tell anyone. And as a freak storm approaches the mountain, Jess has to decide how much Mark's trust means to her. Should she keep his secret even if it puts him in danger? There is some really great writing here, and I always felt like it was true to Mark's character. Having been through an illness like Mark has experienced, it made sense that he would look at the world in this detailed, introspective way. And although there are definitely poignant moments, it never slid into sappiness. I found it a little over-dramatic in some parts, but it's all in the interest of creating a suspenseful and exciting story. This is a story of a sick kid, of a brave kid who does not want to go gently into that dark night. But it's just as much a story of friendship - between a kid and his dog and between best friends who trust each other implicitly. It's something of a tear-jerker (although the parts I personally found the most gut-wrenching were the half-chapters told from his parents' and Jess's perspective, which may resonate differently with child readers). Press this into the hands of kids who are interested in The Fault in Our Stars by John Green but who are not yet ready for the young adult content of that book. I wonder if the cover design purposefully evokes TFIOS's cover for this reason. This would also be a great one for kids who are intrigued by the story of a kid facing his own mortality, such as Ways to Live Forever by Sally Nichols. I might also try this on kids who enjoy character-centered, introspective survival stories like My Side of the Mountain by Jean Craighead George. This story definitely features a main character who's interested in challenging himself and figuring out how to make it up the mountain. I just read this book last week and I found it really compelling, too. Great read!